Researchers have identified an enzyme that is absent in healthy colon tissue but abundant in colon cancer cells, according to a report in the January 26 issue of the Journal of Biological Chemistry. The enzyme appears to drive the conversion of normal colon tissue into cancer by attaching sugar molecules, or glycans, to certain proteins in the cell. Understanding the role that sugar-modified (glycosylated) proteins play in healthy and cancerous cells is an emerging area of cancer biology that may lead to new therapies. Hans Wandall’s team at the University of Copenhagen studied a group of 20 enzymes that initiate the first step in a particular kind of glycan modification, called GalNAc-type O-glycosylation, found on diverse proteins. These enzymes, called GalNAc transferases (GalNAc -Ts) are variously found in different amounts in different tissues, but their functions are poorly understood. 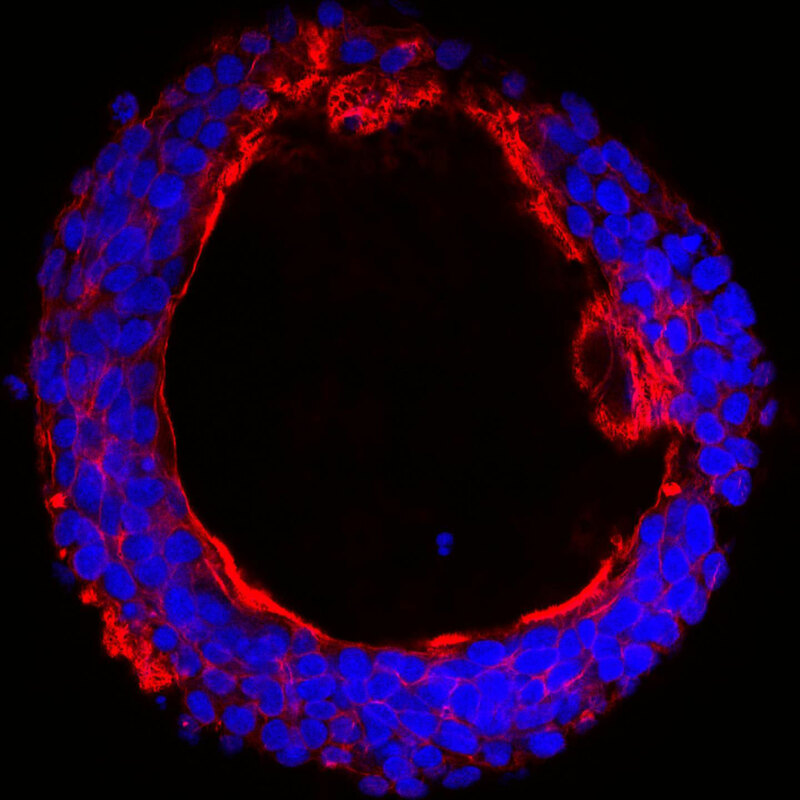 Wandall’s team, led by then-graduate student Kirstine Lavrsen, found that one of the GalNAc-Ts, called GalNAc-T6, was absent in healthy colon tissue but abundant in colon cancer cells. The team used CRISPR/Cas engineering of a colon cancer cell line with and without GalNAc-T6 to understand which proteins the enzyme helped attach sugars to, and what effect this had on the cells. Using mass spectrometry, the team categorized the proteins that GalNAc-T6 acted on in these cells. “Our data suggest [that] this specific enzyme seems to affect a subset of proteins that could be involved in cell-cell adhesion,” Wandall said. In other words, the glycan modifications changed the patterns in which cells stuck together, leading the cells to develop as something that looked more like a tumor than a healthy tissue. The next step, then, is to understand precisely why adding sugars to the specific protein sites modified by GalNAc-T6 leads colon cells to develop abnormally. Glycan modifications can affect protein function in myriad ways. For example, they can make proteins that are usually cleaved into two unable to be cleaved, or prevent two proteins from binding to each other. Wandall hopes that understanding glycosylation in cancer cells will lead to better early diagnostic tools, drugs or immunotherapies. “Glycans add an additional context layer that could help us create more specific interventions,” Wandall says. Be the first to comment on "Scientists Identify Specific Enzyme Related to Colon Cancer"